Yes…luck was on our side this time…our bird watching field trip actually happened! The weather cooperated (no heavy rainfall warnings or snow this time) and there were plenty of interesting birds to see. From the short walk from the parking lot to the waters of the inlet, we saw a dipper, a cooper’s hawk (chased by a crow), and an eagle. 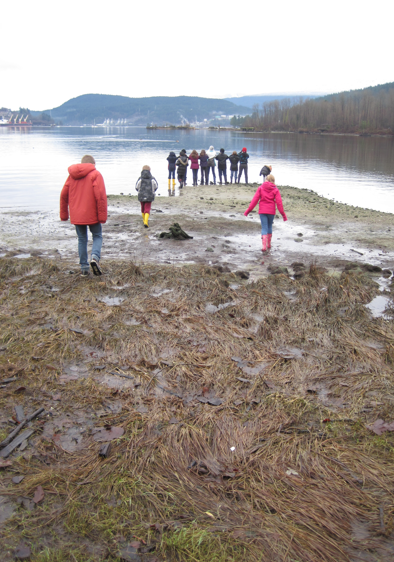 The kids saw salmon eggs in Noon’s Creek, along with the decomposing carcasses of the parents who made the long journey to deposit them there. Buffleheads, mergansers and golden eyes speckled the water. We heard the call of a kingfisher, saw spotted towhees darting out from under the brush, and watched chickadees flit from branch to branch. We even saw a “one-legged” great blue heron. That was my favourite part…the kids were so concerned for the bird, marvelling that it could balance so well. I get a kick out of those moments, because it is so fun to surprise them with the truth. The missing leg miraculously appeared when the bird sprang from the branch and flew through the trees. How often can you observe this creature to discover interesting things about its habits and habitat? Are you inspired to ask questions? Are you inspired to be a detective…to dig in order to answer these questions? Do you have a good source of information on this creature? Can you ask an expert to help you with your questions? Can you photograph your creature or take video? Given that the kids have only just met many of the creatures they have had a chance to observe on our field trips, I don’t want the kids to choose a singe creature to focus on from the start. I knew if I made them choose, I would end up with many students choosing more well known or glamorous creatures, and passing up the opportunity to expand their horizons. I want them to have a little experience chasing some of these creatures down before choosing. I am hoping that they will gravitate to creatures that are more accessible and more surprising. I want to set them on the path of becoming real experts. I want them to let them in on the secret of life in our region. I don’t want this to be just another boring research/poster project.